Dubbed the Moreava Cabins, this cluster of luxurious eco-huts was designed with the delicate ecosystem of Easter Island in mind. 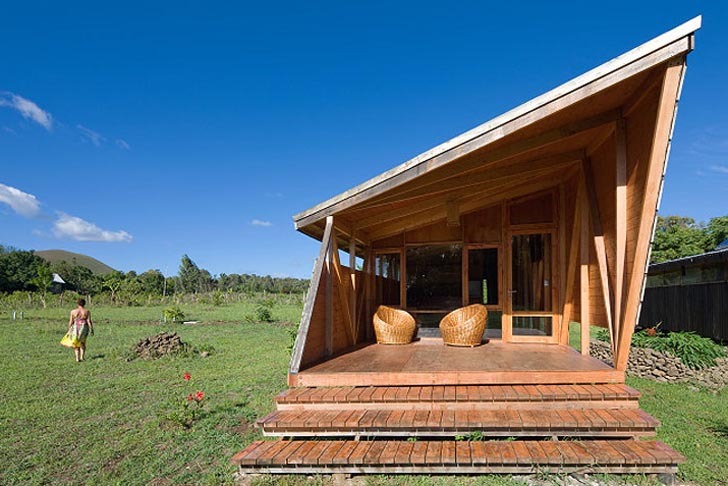 Santiago-based AATA Arquitectos Asociados built the bunch of sustainable huts for guests who want to spend a relaxing time on the island without harming the very wildlife they came to enjoy. With adequate air-flow, solar panels for energy, solar collectors to heat water and low-impact architecture, this holiday retreat will make guests feel closer to nature. The spacious Moreava Cabins are perfect for a group of friends or small family, measuring two square foot each with a 0.5 square foot covered patio area. They were prefabricated on the continent, avoiding waste and optimizing the primary building material: timber. They rest on tiny poles creating low-impact on the land and preventing humidity from penetrating to the interiors. 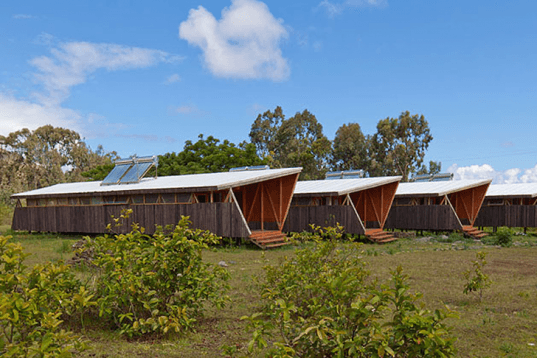 Due to Easter Islands’ subtropical climate, AATA designed a gap between the wood of the huts’ ceilings and the zinc roofs, allowing cool cross-ventilated air to blow freely. Rainwater is collected and stored for re-use in the cabins and solar collectors provide the right temperature for water to use in the kitchen and toilets. The eco-accommodations also get renewable energy from solar panels on the roofs. \\\'measuring two square foot each\\\' - does this measurement make sense? The spacious Moreava Cabins are perfect for a group of friends or small family, measuring two square foot each with a 0.5 square foot covered patio area. They were prefabricated on the continent, avoiding waste and optimizing the primary building material: timber. They rest on tiny poles creating low-impact on the land and preventing humidity penetrating to the interiors. Due to Easter Islands’ subtropical climate, AATA designed a gap between the wood of the hut's ceiling and the zinc roof, allowing cool cross-ventilated air to blow freely. Rainwater is collected and stored for re-usage in the cabins and solar collectors provide the right temperature to use it in the kitchen and toilets. Electricity on the island is produced by a power plant burning diesel brought in by tanker ships, therefore the shelters get renewable energy through solar panels on the roofs. Moreava Cabins on the Easter Island offer great accommodation for eco-tourism aficionados to enjoy some precious in nature while being immersed in the mysteries of the Moais's ancient culture.